Fully Automatic Transmission. Motorcycle license is NOT needed in most States! Big and bright dual headlights, 12" Big Tires, Easy Assembly (45 min assembly time). 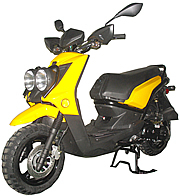 This gas scooter is EPA, DOT approved and is registerable as a street legal vehicle in all 50 states including California (CARB approval is not required for vehicles under 50cc). $99.00 a year; $150.00 for 2 years; $199.00 for 3 years. The manufacturer's warranty starts the day when your scooter is delivered. The extended warranty effective as soon as the manufacturer's warranty expires. If you were to add a 3 year extended warranty at only $199, your scooter's motor and other warranty parts will be covered for a total of 4 years. A 50cc motor costs $500 plus shipping, if anything happens during the first 4 years, we will ship you brand new motors free of charge, same way with other warranty parts. Front tire, handlebar, mirrors, battery set up and minor adjustments are required, assembly time is about 45 minutes plus tune-up. Be sure to tighten all screws, check for appropriate levels of engine fluid and fully charge battery prior to operation. Warranty is valid straight from the box. 49.6cc 4 Stroke engine which is much quieter, cleaner, and will last a lot longer than 2-stroke engines. Proudly introducing the All New ICE BEAR "MADDOG" Full Size 50cc Street Bike. 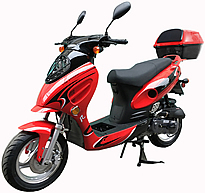 It has the popular design, Big & extra wide tire, Bright lighting system, Aluminum and Chrome details, Fully Automatic transmission, Electric and Kick start, Adjustable front forks and dual rear shocks... Take your daily commute from a tired ordinary ride into an exciting and flashy event. This All New MADDOG is 100% street legal in 50 States including California. 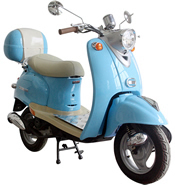 It will be registered as a scooter or moped depending on the state you live in. Most States do not require a motorcycle license, registration or insurance for Mopeds /scooters under 50cc. A regular driver's license would be sufficient! Please check with your local DMV or a licensing place for detail. With top speed of 35 mph, this bike is perfect for zipping around the town or to use as a daily transportation on the city roads. 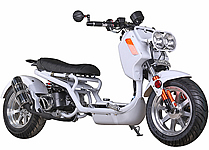 At 70-100 MPG and the gas prices are fluctuating, a motor bike is a smart choice for either a student looking for low cost transportation or anyone who commutes to work. Equipped with 139QMB air cooled engine, 12" front wheel and 12" extra wide rear wheel.. Be the first one to get this beauty. This impressive and yet inexpensive motor bike will make you famous in your neighborhood as " the person with that cool bike"! Parts availability is 100%, we honor the warranty with no excuse.